Go from purchased-to personalized! When it comes time to do the Christmas cards this year, enlist the kids? help in making the cards extra special. 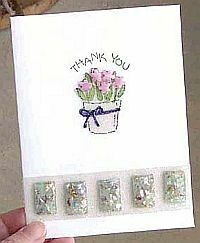 Purchased cards can be embellished easily with beads, tape, and thread. The kids will have fun, and each recipient will receive a personalized, decorative, keepsake card from your family. 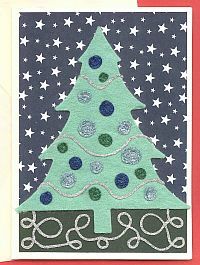 Tip: cards with straight lines and borders are easiest to embellish, since you can use rolls of tape without having to follow a template. 1. Lay a piece of 3/4-inch Treasure Tape across the border you want to decorate. Remove the red liner to expose the sticky tape. 2. Begin decorating the border by laying Facets. Follow the printed lines on your card or create your own design. 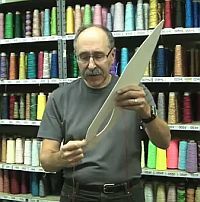 Press the thread into the tape to make sure it adheres firmly. 3. 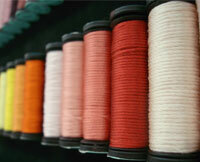 In the same way, lay additional thread to continue decorating this area. 4. Lay the card in your tray and cover the tape area with Diamond Beadlets®. Swirl the beadlets with your fingertips to make sure the remaining sticky areas are fully covered. Tap the card slightly to dislodge any loose beadlets. To print the instructions for this project click on the on the link above "Printable version" and then print the page using your web browser. 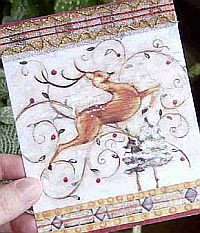 If you have trouble printing this page and would like us to send you a printed copy send a #10 SASE to: Beaded Reindeer Card, P.O. Box 1258, Parkersburg, WV 26102. 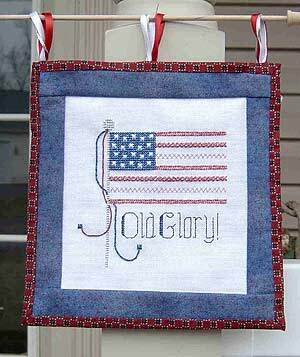 © Copyright 2006 Kreinik. May be reproduced but not sold.